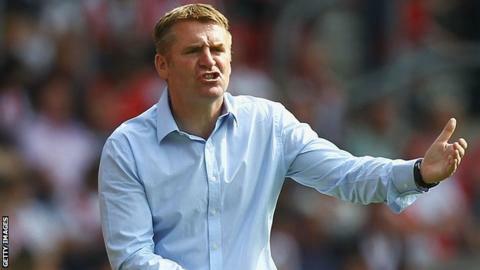 Walsall manager Dean Smith has signed a new two-and-a-half-year contract. The 41-year-old, who began his playing career with the Saddlers, has been in charge of the West Midlands side since January 2011. Having staved off relegation in his first two seasons in charge, they are currently 13th in League One. I've always said that it was going to be small steps; the players have done well so far this season, but as a group we know we can get better and we are always striving to improve. "Dean is an energetic, ambitious and talented young manager who has a real desire to succeed," chief executive Stefan Gamble told the club website. "As a board, we felt that it was important to move quickly and decisively to bring stability to the club and give those tasked with executing our philosophies the necessary security to enable them to effectively plan for the future. "He is well liked by all at the club and well respected by his peers within the game. He knows the club inside-out and has a good understanding of what is required here and the financial parameters within which we have to work." After starting the season well, the Saddlers currently find themselves on a run of six league matches without a win. However Smith insists that he is entirely focused upon the long-term plans that he has set in place to take the club forward in the future. "We have a strategy in place here and a policy running throughout the whole club that will allow us to move forward together and get to where we want to be. Having this deal allows me to continue to plan ahead and build," Smith said. "The foundations are the most important part of any building process and we have carefully put these in place during my time here. "I've always said that it was going to be small steps; the players have done well so far this season, but as a group we know we can get better and we are always striving to improve."